PRINCE SWR SYSTEMS a firm, which immensely believes in "The Systems is Quality & Reliability", have been certified by quality Assurance Services, Australia. The ISO 9001 certification a recent development with a high prestigious certification. 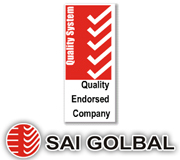 Quality Assurance Services pty Limited (QAS) Australia has certified us as a “QUALITY ENDORSED COMPANY” for Quality Management System for the manufacture and supply of rigid PVC pipes and fittings for soil, waste and rain water (SWR) applications. All our systems complies with the requirements of AS/NZS ISO 9001:2000 Quality systems-Model for quality assurance in production installation and servicing. We achieved ISO 14001:2004 for "Environmental Management System "Certificate No QM 02 00871 & BS OHSAS 18001:2007 for "Occupational Health and Safety Management" certificate No. 44 116 15390610 from TUV NORD CERT GMBH.